A grave post from East Timor, a tree carving from the American South, and ceramic pottery from sources as far-flung as Jamaica and the Himalayas line the office walls of Robert A. Lue, a senior lecturer on molecular and cellular biology. The lone microscope perched on a table in the corner hints at his day-to-day responsibilities as a lecturer—one of five who leads the popular fall course Life Sciences 1a. Lue, a self-described “movie buff,” had his own taste of stardom this week—a mini-movie he made on the workings of the cell was featured on ABC’s primetime show World News on Tuesday night. “Makes you want to go back and take biology,” ABC anchor Charles Gibson said of Lue. And his students—the 613 undergraduates who have enrolled in Life Sciences 1a, the second most popular College course this fall—seem to agree. They say the worldly instructor’s unusual array of interests enlivens his course, an interdisciplinary introduction to chemistry and biology. Lue has combined his life-long passion for art with the field of cellular biology to help develop a computer-generated animation that explains the functioning of a cell. In an October lecture Lue delivered in Sanders Theatre, he presented the animation—backed by a soundtrack of classical music—and received a standing ovation. “I had several students say it helped rekindle their interest in science,” Lue recalls. “I kind of stalked it down on the Internet, and I still watch it from time to time,” Raquel Toledo ’10 says of the movie. A far cry from the typical power point presentation, this multimedia project has “created a national sensation,” attracting the interest of five museums, the College Board, Pixar, and Dreamworks, in addition to the ABC segment, according to Lue. “It has hit a nerve. Lue, who is part-Romanian and part-Chinese, attributes his varied interests to his upbringing in Jamaica, where he says he cultivated a “fascination with the natural world” that would eventually lead to his decision to focus on cellular biology. His native country’s “rich visual culture” inspired a deep-rooted love of art. While attending the College of the Holy Cross in Worcester on a full scholarship, he further developed a fascination with philosophy, science, and studio arts. At graduation, he says, he faced a choice among pursuing a Ph.D in science, a Ph.D in philosophy, or a Master of Fine Arts degree. Instead, he took a year off to paint and do research at Brandeis. Lue ultimately decided to pursue his doctoral degree in cellular biology at Harvard. But his career in science, he says, still gave him the opportunity to work simultaneously as an artist. “If you’re lucky like I was, you can continue to keep alive parts of yourself,” he says. Part of Harvard’s appeal, he adds, was that it gave graduate students the opportunity to teach undergraduates. “His talents were clear right from the start,” recalls his graduate adviser, Daniel Branton, who is also an emeritus professor of biology. Lue chose to teach every term as a graduate student—and consistently got top marks as one of the best rated teaching fellows, according to Branton. 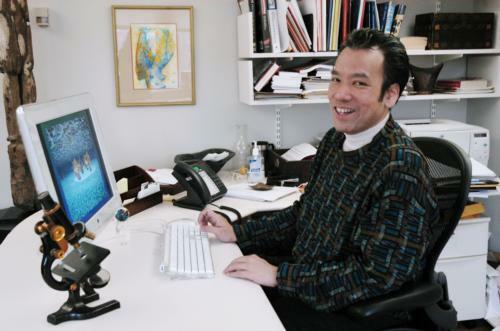 Lue, who has stayed at Harvard since his graduate days, has now spent almost 20 years teaching. He has also sat on three curricular review committees and works halftime as dean of the Summer School.